July's update brings you a good assortment of previously unseen Buchschmid and Gretaux wood inlay pieces for you to study and enjoy. 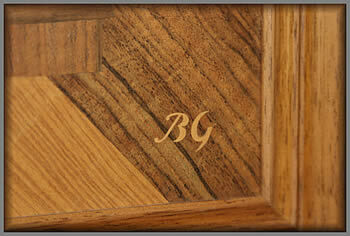 Our first example of a B & G tray appears this month. You may not notice much difference between a tray and a picture, but there are differences, it's just that are not easy to spot, being that they are mainly the depth of the shoulder on the surround which functions as the lip or the carrying edge of the tray. We hope you enjoy our July B & G selection. The uppermost picture in our July Buchschmid and Gretaux selection is a superb example of the B & G floral displays. 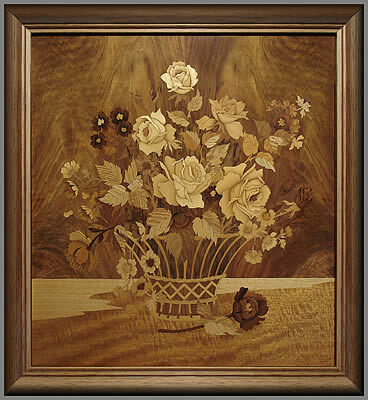 This picture is one of the Flower Basket designs that lend themselves so well to the wood inlay medium. The major background veneer looks like it is a book matched pair of well chosen veneers, but on careful study it appears to be even better than that. We rather think that it is a curl or a crown cut veneer of particular beauty and generous width. The Rose petals display a subtle use of sand shading (scorching) to provide shape, roundness and depth to the flowers. We think you will agree that the technique works superbly in this picture. This beautiful picture is owned by Gail Shinsky, who described to us how she fell in love with it: "I was stationed in Iceland in 1977 and purchased an 18" x 20" Basket of Flowers. At the time, I was 22 years old. I saw those flowers and looked at the detailed work and fell in love with the piece. My friends thought I was crazy to spend that kind of money. I love it today as much as the first day I got it." A wonderful story - thanks for sharing it with us Gail. 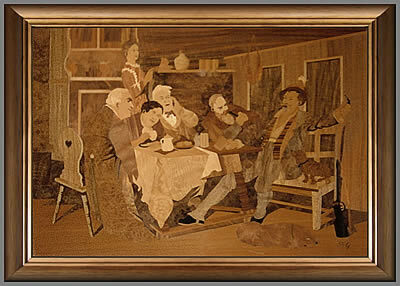 Our next Buchschmid and Gretaux wood inlay work is owned by Ronald Hawn and is another rarely encountered title, this one being "The Penniless Poet". This picture was one of the larger Buchschmid and Gretaux pieces. It is also on some of the B & G listings as "Poor Poet" - although we are given to understand that both titles relate to the same picture design. So, unless we are told anything to the contrary, that is the situation. The Penniless Poet displays an excellent example of good veneer selection. The Walnut for the walls and the Madrona Burr for the brick work fit their allotted tasks well. It goes to show the inportance of selecting the right veneer for the right task. Our third Buchschmid and Gretaux piece for this July update is an example of a B & G tray. The only real difference to the eye between the picture proper and the decorated tray is the look of the frame or surround of the picture. This frame / surround section has a deepish lip which acts as the usual tray handle arrangement. We do not see many B & G trays these days, we rather suspect the reason for this is that the lip / handle arrangement gets broken and the remaining picture from the tray gets converted to a picture proper. We cannot verify this idea, but we rather think this is what gets done to those trays over the years! Our last B & G example for this July update features a picture with a very interesting story. Ann Sorenson rescued this delightful B & G picture from ending its days by being consigned to the ignominious fate of becoming land fill. How anyone could bring themselves to throwing such a superb example of a B & G picture out with the trash amazes us. Still, we suppose there may well be a good and understandable explanation for someone disposing of a delightful B & G picture in such a way, but as we say, we certainly cannot understand why. 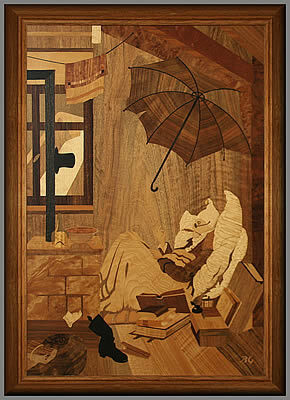 However, we offer our thanks to Ann for having the prescence of mind to rescue this B & G work from its awful fate. 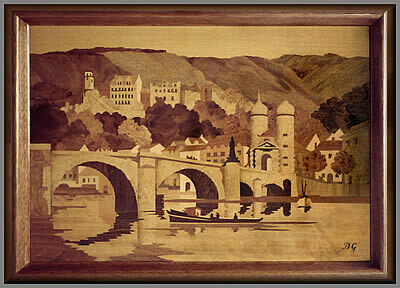 We hope Ann enjoys her ownership of a wonderful example of Buchschmid and Gretaux Wood Inlay work. Such a picture deserves a good home - we think its now got it. Click the above button to return to page 20 of "Can You Help"
Click the above button to visit page 22 of "Can You Help"